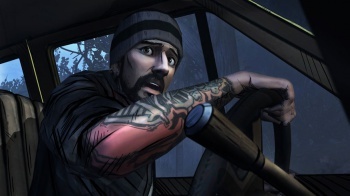 If you bought The Walking Dead: Season 1 on the Telltale store, 400 Days will be a free download. The first piece of downloadable content for Telltale Game's critically acclaimed The Walking Dead adventure game comes out this week for the PC, Xbox 360 and the PS3. It should be out now on PSN, will be out tomorrow for PC users, and Xbox 360 gamers should see it pop up on Friday. The iOS version comes out next week, and PSVita owners will have to wait until August. Better still, if you bought The Walking Dead: Season 1 on Telltale's official store, 400 Days will be a free download, as a thank you from Telltale. This offer extends to any future purchases of Season 1. Everywhere else it will cost $4.99, or the equivalent value in MS points. 400 Days will check to see if you have a Season 1 save file. The decisions you made in Season 1 will have an effect on your 400 Days experience, and choices made in 400 Days will have an effect on the Season 2 storyline. For those of you expecting to to see Clementine or Lee return, bad news, 400 Days is split over 5 short stories; with each presenting the apocalypse through the eyes of a different survivor. The reasoning behind this is that the creators wanted to provide a different perspective on the world of The Walking Dead prior to Season 2 beginning later this year and provide interesting 'connective tissue' between the two seasons. You'll be able to purchase 400 Days from within a special in-game store inside the base Walking Dead game. Telltale have put together an F.A.Q if you have any further questions.